Call 612-558-1737 or complete the form at the bottom of the page to schedule a free estimate. The process for commercial dryer vent cleaning will vary for each site. During the estimate phase, our commercial project manager will evaluate the dryer venting system of the property and lay out a detailed plan that utilizes the most appropriate tools and methods for the configuration of the vent line. ​In a typical setting, our technicians use a high-velocity, reverse-blowing spinning skipper ball at the end of a flexible 50-foot air snake. Once engaged, the reverse air-pressure blasts the lint backward toward the vent opening as the technician feeds the air snake through the vent line until it reaches the back of the dryer unit. He then slowly extracts the tool, again blasting out lint as it is removed. This process is repeated until the system is cleared of all lint. An air wand is then used to clean out the exhaust hood. Finally, the technician ensures that the exhaust damper is working properly. 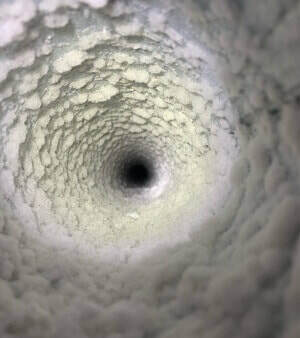 Want to learn more about commercial dryer vent cleaning? 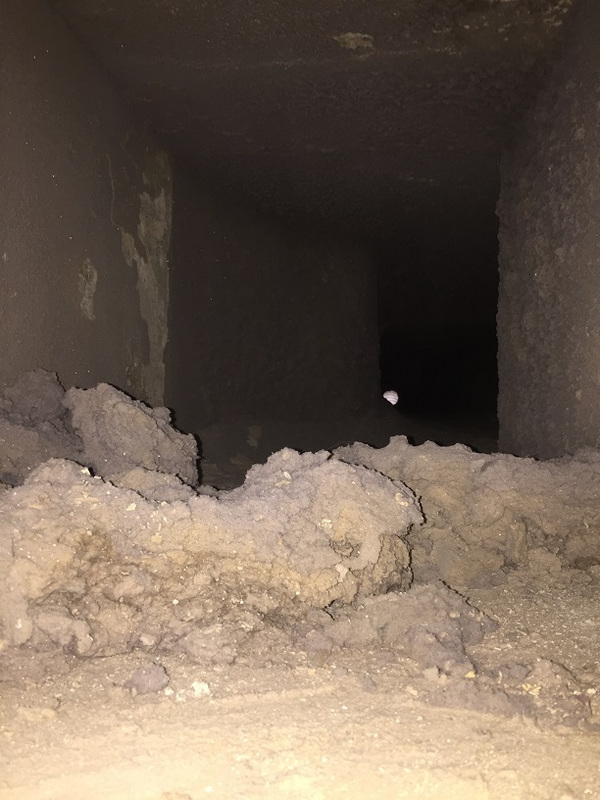 Read our blog article: "​Commercial Dryer Vent Cleaning: What It Is and Why It's Needed." Our commercial technicians excel at cleaning multi-unit buildings and complexes, such as apartments, condominiums, townhomes, and assisted-living. With our specialized equipment, dryer vent cleaning can often be done from the outside only, so as not to inconvenience tenants or require coordination of schedules. 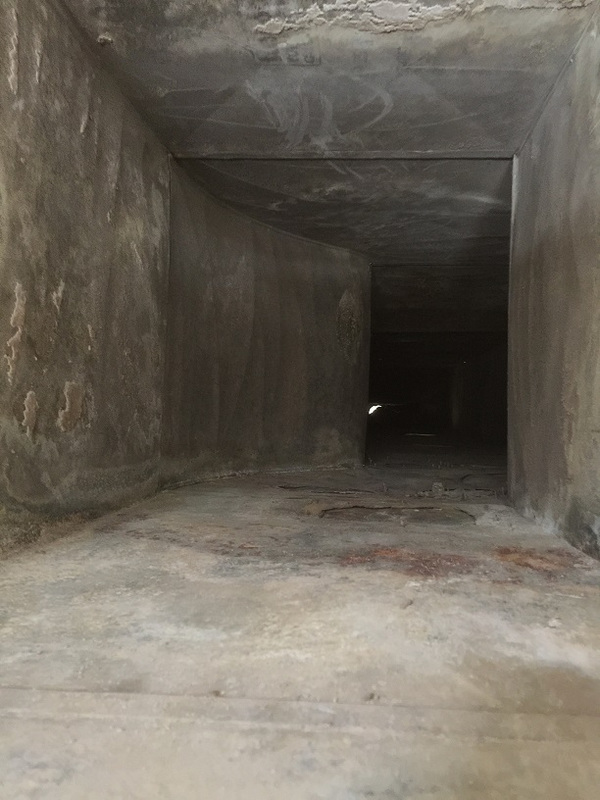 Whether the dryers vent straight out the back of the building or up several stories to the rooftop, our technicians will utilize the most effective method for cleaning the entire length of the dryer duct—from the machine itself all the way through to the outside vent. 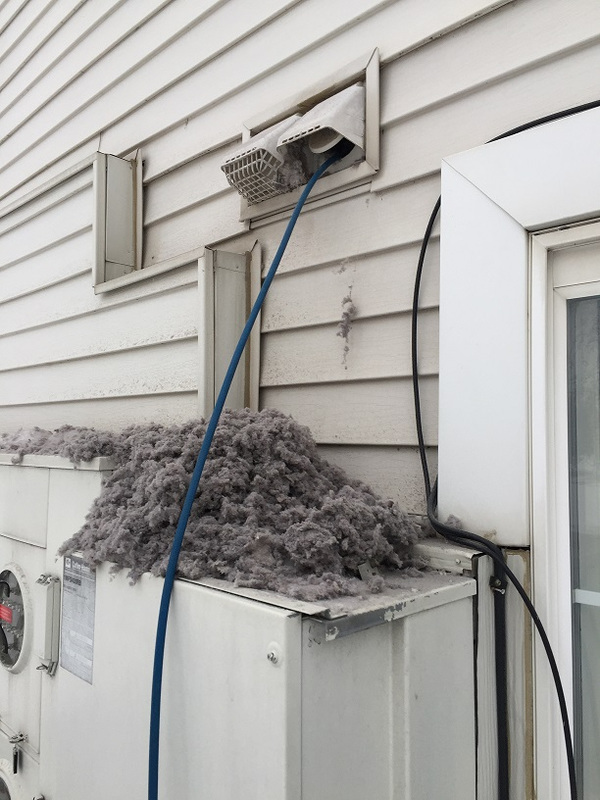 Photo: Lint resulting from a commercial dryer vent cleaning on a townhome property in Minnetonka, MN (left), and on community-used dryers venting to the roof in Minneapolis, MN (right). 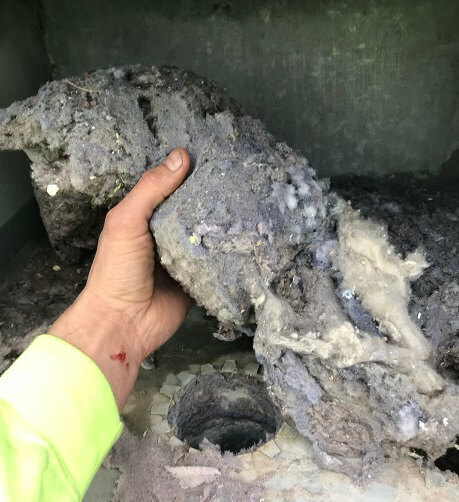 Photo: A 5-inch thick lint colossus covering the dryer and bathroom vents of a multi-story apartment building. After the massive clog was removed, each of the vents was cleaned with a 50-ft long reverse-blowing spinning skipper ball. Job site was in Minneapolis, MN. Several of our spa and salon clients are on a quarterly cleaning schedule, to ensure that they can meet customer demand and that their dryers consistently run at their most efficient. Photo: A salon dryer vent line before and after. Because the line ran for over 100 feet horizontally and vertically and had several 90-degree turns, it was cleaned using a forward-blowing spinning skipper ball, disassembling 25 feet at a time. Job site was Edina, MN. Photo: Laundromat multi-dryer exhaust duct before and after. These ducts had never been cleaned and were coated with 6 inches of lint. 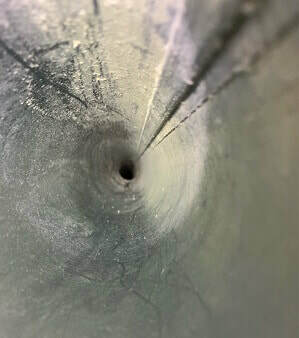 Our technician accomplished the work by physically crawling through the duct as far as space would allow, then using a rotary brush and air wand to clear the remainder. Job site was in St. Paul, MN. Video: TCFC Commercial Project Manager/Site Supervisor Ben S. explains the process of cleaning the dryer vents of a multi-unit complex from the rooftop. Video: Demonstration by TCFC Commercial Project Manager/Site Supervisor Ben S. of rooftop dryer vent cleaning.